Until Zoobug I was pretty convinced that sunglasses and those under 3 did not mix. I always felt bad for my little guys when the sun would get in their eyes but they couldn't seem to handle wearing sunglasses. Most seemed to pinch their head and the others would be mysteriously broken in a matter of hours (my boys play rough). I had no idea until recently that children's eyes actually need protection from UV rays more than adults. After that news flash finding quality eye wear for my children became a priority. 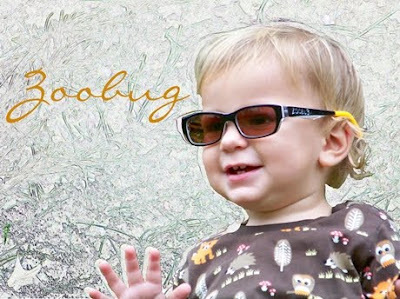 Zoobug has a line of stylish eye wear for your wee one and they will shock you with their durability. 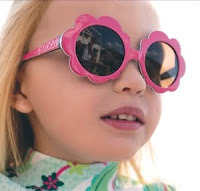 Designed with kids in mind - they not only fit well but offer maximum protection for developing eyes. I was extremely impressed with the unique curly arms which made them stay comfortably put even on my wiggly child's head. Available in 4 adorable styles and packaged in a convenient storage case - Zoobugs are the ultimate in children's eye wear. Take a moment to browse the complete Zoobug collection and find the style that is perfect for your little hipster. I protect my children's skin from the sun and now I can protect their eye site too.